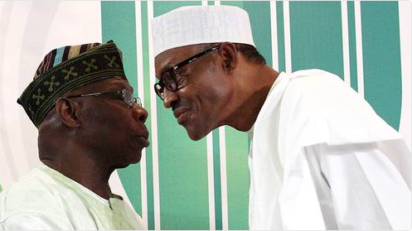 Former President Olusegun Obasanjo yesterday charged Nigerians not to despair in frontally addressing the failures of President Muhammadu Buhari’s administration, saying it was reassuring that the international community has positioned itself to help secure the country’s democracy. Buhari’s failures, as the former president pointed out, are in the areas of security, fighting corruption, and job creation. Obasanjo spoke at the launch of a book that articulated the political odyssey of President Buhari in Abuja where he, in a recent rare commendation, lauded the President for making himself as a vehicle for change in 2015. The assertions came as the President yesterday fired back at his presidential opponent in the polls, Atiku Abubakar, for allegedly churning out lies during Wednesday’s interview session with veteran broadcaster, Kadaria Ahmed. The President warned Nigerians not to entrust their commonwealth to Atiku, even as the ruling All Progressives Congress, APC, echoed the same comments, attacking Atiku’s plans to get the country working again. President Obasanjo spoke at the launch of the book, “Politics as dashed hopes in Nigeria,” authored by Dr. Auwalu Anwar, a former aide of President Obasanjo. Obasanjo, chairman of the book presentation at the Shehu Yar’Adua Centre, Abuja, noted that democracy without a strong opposition was akin to a marriage without a bridegroom to consummate the marriage. The book launch was attended by some of Nigeria’s most visible political actors, including Atiku who was represented by Senator Rabiu Kwankwanso; former Chief Justice of Nigeria, Justice Muhammadu Lawal Uwais; Governor Nasir El- Rufai of Kaduna, who was represented by his deputy, Mr Bala Bantex; Professor Terhemba Shija, the book reviewer, Dr. Umar Ardo, Senator Ibrahim Ida, and former APC spokesman, Mallam Bolaji Abdullahi, among others. Also present were the spokesperson of Afenifere, Yinka Odunmakin, and former Minister of State, Defence, Johnson Aguiyi-Ironsi, Jnr. Obasanjo said in his speech: “Since the book is about The Buhari Organisation, TBO, Congress for Progressive Change, CPC, All Progressive Congress, APC, and Buhari’s political life and activities up to the second year of Buhari’s administration, I will touch on two or three points that may be of interest to all of us. “President Buhari served the purpose of galvanizing efforts to get Jonathan and PDP out of office. Buhari and the APC must get the credit because democracy without a strong opposition is like a marriage without the bridegroom consummating the marriage. “But on the mid-term scorecard, Dr. Anwar pointed out three significant and tangible areas of failure; security, fighting corruption and job creation. As at today, these three areas are still what they were at mid-term, not yet a success story. “Dr. Anwar touched on another significant but intangible areas of failure; exemplary leadership which induce character and power for the sake of what may be called power for self-aggrandisement. I can say that I understand where Dr. Anwar is coming from to get the title of the book, but we must face despair with optimism. Noting the fact that Nigeria, Senegal, Ghana, and Cote d’Ivoire were soon to face general elections, the former Nigerian leader said it was ironic that in all four countries, the incumbent administrations came from the opposition to power on the platform of democracy. “If we all cherish democracy, we will all guard and protect our fledgling democracy and that, I believe, is the main purpose of Dr. Anwar’s book. “As for me, I will do everything within me possible to safeguard democracy for good governance in Nigeria and for all Nigerians. “I am particularly happy in this respect that most Nigerians themselves are rising to their duties, obligations, and responsibilities as guardians of our democracy. I commend all those that are standing for democracy. Remember that if you stand aloof when evil is being perpetrated, you will become an accomplice in the perpetration of evil. “Nigerians must be the architect of their fortunes and future progress but equally gratifying is that the international community has accepted the responsibility and committed themselves to take necessary actions to ensure the health and sustenance of our democracy, therefore, making politics a great hope for Nigeria, for West Africa and, indeed, for Africa rather than great despair or dashed hopes. In his keynote address, former presidential aide and a member of the House of Representatives, Dr. Usman Bugaje, lamented that poor governance was deepening poverty in the country and questioned the rationale for making secondary education the eligibility to be President of the country. Also recommending Rwanda’s philosophy to address ethnic differences in the country, Bugaje said: “Today, if you go to Rwanda, you cannot know who is a Tutsi, who is a Hutu. If you ask them, you will never get an answer. Meanwhile, President Buhari yesterday sharply rebuked the PDP presidential candidate, Atiku Abubakar, on what he claimed were lies allegedly churned out during the interview session with Ms. Kadaria Ahmed last Wednesday. He charged Nigerians to be wary of Atiku, and his running mate, Peter Obi, who he said could mortgage the country’s commonwealth to themselves. In a statement articulated by his campaign spokesman, Festus Keyamo, SAN, the President accused Atiku of lying about the country’s GDP at the point of hand-over in May 2015, that the APC caused the recession in 2015, that insecurity was restricted to the North-East in the preceding regime and that the number of out-of-school children grew to 12.5 million during his regime. Buhari also debunked as a lie Atiku’s justification that the law allowed him to set up a private company while still working in the Customs and the claim by Mr. Obi that Nigeria’s poverty level was at a record level. He said: “Yesterday, Nigerians watched with shock and dismay the bare-faced lies, and outright dishonest claims of the Presidential and Vice Presidential candidates of the Peoples Democratic Party, PDP, Alhaji Atiku Abubakar and Peter Obi in the television show tagged ‘The Candidates’. On the GDP growth rate, he said: “With a consistent and rapid drop of our GDP, their Coordinating Minister of the Economy at that time, Okonjo-Iweala, former Central Bank Governor Prof. Charles Soludo, and the Central Bank Governor at the time, now Emir of Kano, Sanusi Lamido Sanusi, warned the PDP government and Nigerians that we were headed for a recession. On the spread of the insurgency, he said: “Nigerians will recall that the Boko Haram activities had spread all over the North East, North West and North Central. On Obi’s claim that the population of out-of-school children was 13.5 million under this administration, he said: “The figure of 13.2 million out-of-school children was a 2015 survey by UNICEF. On Atiku’s justification for establishing his company while still in service, he said: “The Code of Conduct for Public Officers was first enshrined in the 1979 constitution of the Federal Republic of Nigeria. ‘’Atiku Abubakar co-founded the company, as a serving Customs officer, three years after the 1979 constitution came into operation” which according to him forbade a public officer from putting himself in a position where his personal interest conflicts with his duties. On Obi’s claim that Nigeria was experiencing record poverty, he said: “Despite high oil revenue, according to the World Bank, extreme poverty under PDP grew to 112 million in 2013 through 2014, compared to 86 million today. India pulled their citizens out of poverty for over two decades by using the same methods Nigeria is now using today. ‘’In summary one would have thought that in the course of the programme, ‘The Candidates’, Atiku/Obi would have modified the lies they told earlier in their campaigns and make it consistent with reality as most of them were already fact-checked by independent bodies and proven to be lies. The APC also spoke in the same light at a press conference addressed by its spokesperson, Mallam Lanre Issa-Onilu. He said that going by Atiku and Obi’s “shocking confession” that their administration will grant amnesty to looters, “we are equally shocked and hereby align with the wide section of Nigerians who are now abundantly clear of their intentions if elected and now see the collective need to stop them”.